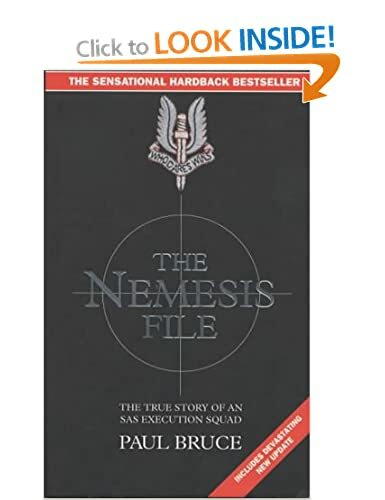 Paul Bruce was a tough, idealistic young trooper in the SAS when he was dispatched to Northern Ireland. His squad's top-secret mission, code sign "Nemesis" - to execute unarmed IRA suspects in cold blood. Bruce and his squad shot down one terrified victim after another, leaving their bodies buried in unmarked woodland graves. Slowly they grew bitter at the sordidness of their assignment, yet worse was to follow with new orders from British military leaders, to forment sectarian violence by shooting down young men on the streets of Roman Catholic areas. This is Bruce's story. Holywood star Liam Neeson and his fellow Northern Irish actor James Nesbitt have issued an appeal for the IRA and other republican organisations to give fresh information on the "disappeared" of the Troubles. The actors backed demands from the victims' families for further information leading to the recovery of their loved ones' remains. Seventeen people were murdered and buried in secret, mainly by the Provisional IRA, during the Troubles. Ten bodies have been recovered but a further seven have never been found. The missing, presumed dead, include west Belfast IRA men Joe Lynskey and Brendan Megraw, as well as Captain Robert Nairac of the SAS. All three were killed by the IRA. The Irish National Liberation Army disappeared one of its members, Seamus Ruddy, whose body has never been found after he was kidnapped in Paris. A day of reflection is being held to commemorate the disappeared on Friday, the longest day of the year. The Commission for the Location of Victims' Remains was set up after the 1998 Good Friday agreement to get confidential information that might lead to the location of those never found . The statement from Neeson and Nesbitt was issued to coincide with the launch of a new book, The Disappeared Of Northern Ireland's Troubles, which collates the stories of 14 of the families. Did they attempt to interview the man who would or would not have signed off this covert action Defence Secretary in 1973/3 Lord Peter Carrington of Bilderberg and Operation Market Garden infamy for this show? An undercover British Army squad took out IRA suspects in Belfast, an explosive documentary will claim tonight. Former soldiers from the Military Reaction Force have revealed how for 14 months they targeted terrorists by imitating their tactics such as drive-by shootings. BBC’s Panorama claims unarmed civilians accused of having IRA links were gunned down in 1972. The revelations come a day after Northern Ireland’s attorney-general called for an end to prosecutions for Troubles-related killings. Britain’s Secret Terror Force will be shown on BBC1 at 9pm. Britain’s conservative newspapers are obsessed by claims of Russian intelligence interfering in UK and US elections and Skripal allegations, but they have no interest in exposing the illegal activities of MI5 and MI6. The Undercover Research Group worked with the Guardian newspaper to expose the fact that in the last 50 years 124 organisations have been infiltrated and spied on even though many of these were anti-war and anti-racist activists, environmentalists or animal rights groups – a total of 144 spies targeted them. Whilst I would expect our intelligence services to infiltrate terrorist groups planning to bomb and kill, it’s hard to see what threat people campaigning for equal rights posed to Britain. A total of 24 agents infiltrated the Socialist Workers Party, a small Trotskyist group with a couple of thousand members, even though London’s police recorded that the SWP did “not have a recorded propensity for violence,” the Guardian wrote. It was also revealed that many of these undercover agents seduced women in the organisations and left them pregnant. The government has been forced to set up a public inquiry headed by a retired judge, Sir John Mitting, who will investigate the last fifty years of these activities. I have been approached by lawyers working on this inquiry who wanted to know if I was aware of the identity of any agents who had been spying on me. I’m really looking forward to going to the public hearings when they start. The second biggest organisation targeted was the anti-Vietnam war campaign (which I was a part of) which had nine spies allocated to it between 1968 and 1972, even though all we ever did was go on demonstrations. Altogether ten environmental campaigns and nine anti-racism organisations were spied on as well as twenty-two left-wing groups. Oddly, those campaigning for animal rights were also penetrated, along with the campaign against apartheid. Some trade unions had undercover agents working in them and even families who were campaigning against police misconduct towards their family. Mitting’s inquiry has revealed that the police have data on over a thousand political groups from those years. I’m hoping that his inquiry will also reveal the full extent of racism in MI5, where senior officials did not believe that black people could be recruited to any high-level role in the organisation because they could not be trusted. This has been revealed by Dr Dan Lomas of the University of Salford, who has investigated MI5 files from the 1960s. Those files reveal opposition amongst Whitehall officials to the Labour government’s plans to make it illegal to discriminate against workers on the grounds of their race. Lomas reported that MI5 had a deep distrust of Jews and that in the 1950s discrimination against homosexuals and anyone with mental illness permeated MI5. As the Labour government in the 1960s continued to recruit black people they were not allowed access to secret documents and still today MI5 is being criticised because of the absence of racial minorities in top posts. At a meeting at the Cabinet Office in 1967, MI5 warned of their concerns about members of the Windrush generation. Officials recorded that “coloured staff” had to be resident in Britain for ten years before they could be vetted. MI5 warned that “simply from the colour of a man’s skin which gave him a chip on his shoulder,” this posed a risk to Britain. But Lomas has made it clear that there are no MI5 files recording any instance of a black British person spying for our enemies. When I became leader of the Greater London Council in 1981, I would finish a phone call at home and put the phone down, but if I picked it up to make another call I could hear a recording of my previous conversation being played back. So I assumed I was a target of MI5, but as I didn’t have any secrets I wasn’t too worried about it. I only really got interested in MI5 during the 1987 general election when I was standing as a candidate. The Tory press had reporters following me throughout the campaign and attending every public meeting I held. At a meeting in Kilburn just a week before polling day, the other speaker was Captain Fred Holroyd, an ex-intelligence officer who was a critic of the methods MI5 used against the IRA in Northern Ireland. The moment he started to express his doubts he was immediately accused of mental instability and dismissed as an intelligence officer. I found Fred’s speech amazing. Although he was right-wing, loyal to Britain and had been army-barmy as a child, he genuinely believed that MI5’s dirty war against the IRA was increasing their support. The audience was most shocked when he revealed that he worked in the same corridor in army intelligence in Northern Ireland as Captain Robert Nairac, who had illegally crossed the Irish border to allegedly assassinate a senior IRA member John Francis Green on January 10, 1975. On his return Nairac showed Fred photographs of Green’s body but the gun he allegedly used to kill Green was also used on July 21 1975 when three members of Ireland’s most popular pop group, the Miami Showband, were murdered. Fred told the audience that Nairac had led a group of loyalist Ulster Volunteer Force members over the border, stopped the coach carrying the band and planted a bomb in the minibus. Because of a mistake the bomb went off killing two of the UVF members in his team. The other UVF members, along with two British soldiers, then shot the three band members in cold blood. Their plan, he claimed, was that this outrageous killing would wreck the ceasefire which the Labour government had negotiated with the IRA. Holroyd told us that this had been organised by rogue elements in MI5 who feared Wilson’s government was pro-Soviet Union and wanted Wilson out of office. According to Fred, this campaign was called Operation Clockwork Orange and these rogue officers in the army and MI5 had worked with Airey Neave, who was Thatcher’s closest confidante and shadow Northern Ireland secretary. He was absolutely clear that Neave knew about these dirty war killings. I didn’t automatically believe that all this would be true, but I was shocked the next day to see that not a single journalist reported what he had said in their papers. This made me deeply suspicious and so I raised these issues in my maiden speech in the House of Commons shortly after the election. Two Tory MPs intervened to stop my speech which was the first time ever a member’s maiden speech had been interrupted. I put down dozens of questions to the government and challenged Margaret Thatcher directly during the Prime Minister’s Question Time. Her response convinced me that the allegations were true, but the government consistently avoided answering or investigating my accusations. I also got help from Colin Wallace, another former intelligence officer in Northern Ireland, who was part of the Clockwork Orange project, but once he was considered unreliable he had been framed with a dead body put in the boot of his car and was convicted of manslaughter, although this decision would be overturned by the courts years later. The journalist Paul Foot was also investigating this and produced an excellent account in his book ‘Who Framed Colin Wallace?’. I continued to get two years of abuse from Tory MPs and Tory newspapers, until civil servants searching files at the public records office in Kew to find an answer to one of my questions, found the only Clockwork Orange file that had not been destroyed. Alan Clark, who was then a minister of defence, wrote in his diary about the panic in the ministry now that this had all come out. He said: “Two crises occupy the department… the first is something to do with the dirty tricks campaign… as far as I’m concerned dirty tricks are part and parcel of effective government”. Seán Murray, who directed ‘Unquiet Graves: the Story of the Glennane Gang’, with actor Stephen Rea who narrates the documentary about the loyalist paramilitary group believed responsible for more than 120 killings in the early to mid 1970s. A former RUC officer has alleged that British intelligence tried to persuade the Ulster Volunteer Force to attack a Catholic primary school in Co Armagh in retaliation for the Kingsmill massacre, in a new documentary to be premiered in Belfast on Thursday. In the feature length documentary, Unquiet Graves: The Story of the Glenanne Gang, ex-RUC officer John Weir claims that British military intelligence was behind a plot to attack the primary school at Belleeks in Co Armagh and to kill children and teachers. Weir, a self-confessed member of the Glennane Gang, who was convicted of the 1977 murder of Catholic man William Strathearn, said the UVF was urged to carry out the attack in retaliation for the 1976 Kingsmill massacre in which the IRA singled out and killed 10 Protestant workmen. “The plan that was decided on was to shoot up a school in Belleeks,” said Weir, who added that the targets would be “children and teachers”. Long since released and now living in South Africa, Weir told the director of the film Seán Murray that the alleged plan by British military intelligence was to cause the situation in Northern Ireland to “spiral out of control”. Mr Murray, who comes from a west Belfast republican family, said from his conversations with Weir in South Africa the alleged British military intelligence plot was to foment a “civil war”. “From their vision such a war would be quite short; they thought they could have a quick, short and sharp process of cleansing out the IRA,” said Mr Murray. In the end the UVF refused to carry out the attack, said Weir. Mr Murray said that Weir in granting the interview was engaging in a “cathartic process – I think he was trying to get as much information off his chest as possible”. The film is based on Anne Cadwallader’s book, Lethal Allies which recounts how the Glennane Gang of loyalist paramilitaries, frequently working in collusion with RUC officers and Ulster Defence Regiment soldiers in the mid-Ulster area, is estimated to have killed more than 120 people, the vast majority of them Catholics, between 1972 and 1976. Lethal Allies is largely based on investigations carried out by the now defunct Historical Enquiries Team, a division of the PSNI, and on declassified papers and official reports. The gang’s victims included the 33 people killed in the 1974 Dublin and Monaghan bombings, those killed in the 1975 gun and bomb attack on the Miami Showband, the 1976 killings of six members of the Reavey and O’Dowd families in south Armagh and the killings in August 1975 of Seán Farmer and 22-year-old Colm McCartney, a cousin of the late Nobel laureate Seamus Heaney. Mr Murray (42) is a nephew and godchild of Danny McCann, one of three IRA members killed by the SAS in Gibraltar in 1988 where they were allegedly planning a car bomb attack on a British army changing of the guard ceremony. He is a son of the senior Belfast republican Seán “Spike” Murray. Mr Murray, who initially ran a retail business but studied film-making in the past eight years, said those memories prompted him to get involved in documentaries that had an “over-arching look at collusion”. He said that Unquiet Graves would be shown in independent cinemas in Ireland and will be broadcast by RTÉ in May. It will also be shown in the US, Canada, Europe and Australia and on iTunes, Google Play and Amazon Prime. Mr Murray said the story of the Glennane Gang and its victims would be particularly revelatory for international audiences. “A lot of this local people will be well aware of it but internationally I think it is going to dumbfound audiences,” he said. The “not-for-profit” film is narrated by actor Stephen Rea and funded by charitable donations, crowd funding and by the film-maker. Mr Murray is working on a documentary about the controversial death of British government chemical weapons expert Dr David Kelly who took his own life in 2003 after being exposed as the source of a BBC story that claimed Tony Blair’s administration “sexed up” the “weapons of mass destruction” threat of Iraqi leader Saddam Hussein – one of the central justifications for the 2003 invasion of Iraq.